Scot Heat & Power, a leading name in the supply of renewable heat from biomass boilers and biomass fuel has been thanked by organisers of the 216th Westmorland County Show for its sponsorship of the event. This big date on the Cumbrian calendar – organised by Westmorland County Agricultural Society – took place on Thursday 10 September at Lane Farm in Kendal, attracting 35,550. It is one of the largest one-day shows in the country and one of the oldest too, with the Society founded in 1799 – and Scot Heat & Power was delighted to be involved. Recently announcing a joint agreement with boiler maker Cochran Ltd, of Dumfries, to develop large biomass projects, the company sponsored the Westmorland County Show’s popular Learning for Life Marquee. This saw schools and colleges use their stands to display special projects, including art, craft and technology work, or exhibits dealing with environmental issues. Interactive exhibits encouraged children to take part, providing lots of public interest and a real highlight of the event which showcased the abilities of dozens of schools and youth groups. In a letter to Scot Heat & Power, Christine Knipe said: “What a phenomenal day! The 216th Westmorland County Show appears to have been an enormous success. “The fields were bursting with trade stands, the marquees packed and throughout the showground, lots of smiling faces could be seen. “The support of our sponsors is greatly appreciated and has been significant in helping the Society continue to develop the show. “The Learning for Life Marquee, originally known as the ‘Schools Tent’, has attracted tremendous interest from the public, press and TV, being developed by volunteer stewards David and Liz Lawson. Scotland-based Scot Heat & Power aims to help the strong agri-business, tourism, and large commercial sector take advantage of the financial and environmental benefits of renewable heat and power produced from biomass. It is one of the few companies in the UK that designs, installs, and commissions biomass boilers from 60kW to 20 megawatts including CHP, providing on-going maintenance and a fuel-dedicated supply service, including wood chips, wood pellets and timber by-products. 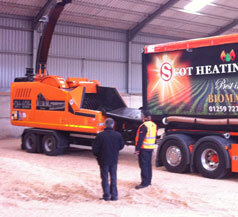 Scot Heat & Power has a fleet of large mobile wood chippers, managing the entire process for biomass boilers purchasers, from the initial site survey and bespoke installation – managing any civil or building works that may be required – through to regular system / maintenance contracts and ongoing fuel supply. Scot Heat & Power’s Managing Director, Malcolm Snowie said: “We were only too pleased to be part of the historic Westmorland County Show with its rich traditions, upheld over more than two centuries. “With a huge amount of visitors pouring in throughout the day and supporting local businesses, it proved to be a fantastic event. “In particular, the Learning for Life Marquee was a hugely creative place for all involved, bubbling over with the exciting ideas of young minds. We were proud to be associated with its local education focus and found its teachings to be very rewarding, including a strong environmental onus which is a massive part of what we do. “We are now looking forward to having a stronger presence in Cumbria in future. Scot Heat & Power is expanding its operations into North England, and is currently negotiating additional depots within the region. “As a result, we will imminently be undertaking a recruitment drive that will tap into Cumbria’s wide pool of talent while boosting local employment.